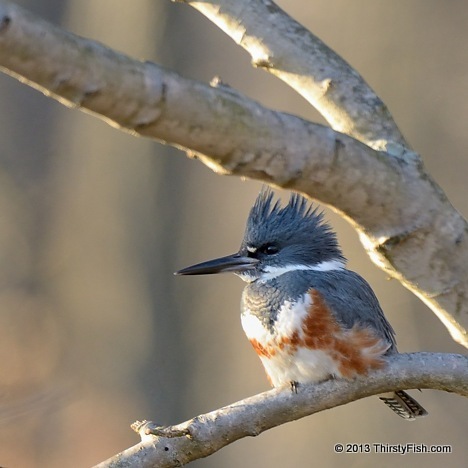 Do you remember the Male Belted Kingfisher from an earlier post? The female, pictured above, has a distinct rusty band on on its belly, which lacks in the male. The Belted Kingfisher is the only Kingfisher found in the United States and Canada. It has a large head, ragged crest and a heavy bill. Kingfishers live near streams, rivers, ponds and lakes, in areas where the water doesn't freeze during winter, so that they always have access to aquatic foods.